I bid a sad adieu to a one of kind TV character that I have watched half of my life and that I have read since I was a child. I am not prejudiced, I have loved all the portrayals of that brilliant Belgian detective, Hercule Poirot. But on Sunday they finally showed Curtain to the American public and I saw the final performance of David Suchet the amazingly talented actor who played the one of a kind detective; Hercule Poirot. Agatha Christie, the most famous mystery writer and most popular of all time created the petite finicky brilliant sleuth in the 1920’s when she saw a group of refugees from Belgium walking through her village. She saw one man who was the inspiration of a lifetime. From the small round frame, the egg-shaped head that tilted to one side and a huge mustache. Though the character could be played as a figure of fun it is not in this series. He has a great sense of humor and can be very witty but he is portrayed as a bright, funny, kind, compassionate, perceptive man. He has his faults too, he can be a bit arrogant and egotistical. He is very particular, he wants everything straight and just so. He straightens pictures and books and objects of art. He can’t have his eggs if they are not exactly the same size and he always puts a handkerchief down if he sits on a bench outside. He is dapper and dressed with smartness and care. Though he is a bit old-fashioned he is not judgmental. He is a full-fledged person though he is a character he is not at all two-dimensional thanks to Agatha Christie’s, brilliant mind. Her pen never allows him to be a figure of fun but he can be amusing and very lovable. David Suchet who has played him for 25 years and brought him to another level. ( I still love Peter Ustinov’s and Albert Finney’s portrayals and will watch it every time they are on) His portrayal is always right on the mark. The man becomes the Belgian sleuth. From his walk to his accent to the way he builds of castle of cards. I will miss him. This entry was posted in Agatha Christie, Curtain, David Suchet, Hercule Poirot., London, mystery, tv and tagged 1920's, 25 years, Agatha Christie's, Belgian sleuth, David Suchet, Hercule Poirot by rithebard. Bookmark the permalink. I didn’t know Poirot was based on a real person! 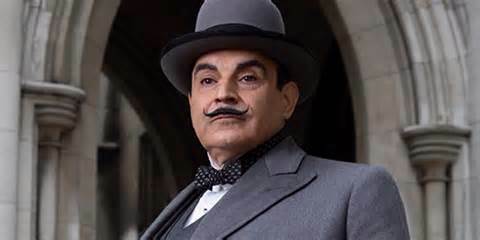 I love the books too and think David Suchet has been an amazing Poirot.